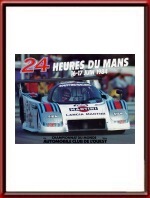 Vintage Original 1984 24 Hours of Le Mans Poster. 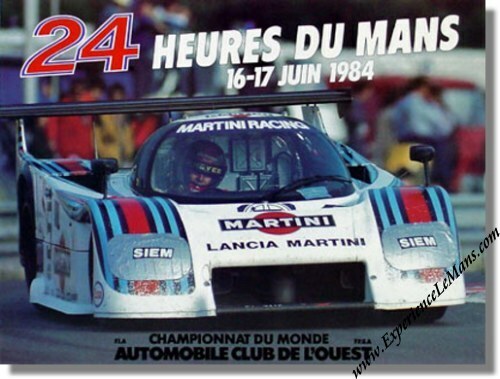 The 1984 Le Mans poster is part of the "The star car used for sponsorship" era in Le Mans posters which lasted from 1981 to 1997. There is little known about the photographer or the producer of the 1984 poster which prominently features Hans Heyer at the wheel of the Lancia Martini LC/2 84, which would retire in the race with mechanical problems. The race was virtual Porsche party as the first 7 (!) places went to Porsche 956's and was won by Henri Pescarolo & Klaus Ludwig in their # 7 Porsche 956B with a total of 360 laps to their name. For the full results of this race, please see 24 Heures du Mans results 1984.